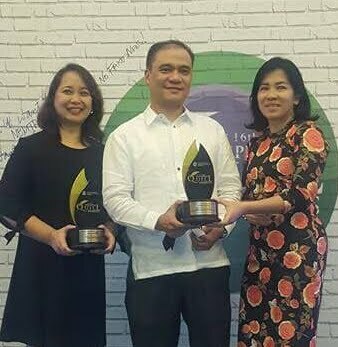 Philippine Savings Bank (PSBank) took home two Award of Merit recognition at the 16th Philippine Quill Awards organized by the International Association of Business Communicators (IABC) Philippines held last July 9 at the Marriott Grand Ballroom, Newport City. The awards received by the Bank were for its 2016 Annual Report entitled, #WeAreWhereYouAre, under the Publications category and its PayMe “Sweldo” situational commercial under the Marketing, Advertising, and Brand Communications category. The PSBank 2016 Annual Report is a communication tool that conveyed to all its stakeholders the Bank’s efforts in strengthening its customer-centric culture through the Bank’s products, services, and by employing the power of social media as another channel to communicate, serve, and discover more about its customers. Meanwhile, the PayMe “Sweldo” sitummercial was published on social media platforms to further boost awareness and knowledge of the PSBank Mobile app PayMe feature which enables clients to request and collect funds real-time from other PSBank Mobile users, making collection of payments quick and easy. The video garnered five million views in just one week after it was released on the Bank’s official Facebook page in 2017. The Philippine Quill, touted as the country’s most prestigious awards program in the field of business communication, adopted the theme “Purpose in Communication” honoring organizations and companies that delivered value and showcased the need for purposeful communications in 2017.